When I see accusations that a trainer with a high win percentage cheats I have to ask "What Is Cheating?" There is lots of buzz lately, both pro and con, due to a recent Sun article. The article doesn't really define what cheating is or where the line is drawn. It is hard to cheat when you can't define what cheating is. Cheating of course includes overages and jockeys using buzzers, but what else does cheating include? Let me bore you with my thoughts. Horse racing has banned substances, but no list of approved substances. If a trainer uses a substance that may enhance a horse's performance but it is not a banned substance, is it cheating? This illustrates how subjective cheating in horse racing is. My definition of a super trainer is someone who wins a very high percentage of races. I'll go one step further. I've watched thousands of races in my lifetime and the one thing I've noticed about recent super trainers is the way their horses tend to have a second wind during the stretch run, as if they were buzzed or as if an oxygen tank was turned on mid stretch causing the horse to rebreak. I've written about super trainers as far back as 9 years ago. It is a fact that some (many?) trainers push the envelope and try new things, things that aren't tested for. We know that, because some have been "caught" doing that. But where is the line when it comes to cheating? Trainers can use non banned supplements to build a horse up. Is that cheating? Trainers can use drugs that aren't being tested for to do the same. Is that cheating? Trainers can use hyperbaric oxygen chambers to build up a horse. Is that cheating? Trainers can use shock waves or acupuncture to lessen pain. Is that cheating? What about using plant derivatives to kill pain or increase red blood cell counts? Is that cheating? I'm not sure about just going the hay and oats way, but in order to curb "cheating" there has to be a definitive list of approved drugs and treatments. Anything not on the list would count as cheating. Will that stop cheating? It depends on the on the consequences when one gets caught. Right now, there isn't much of a deterrence out there. How can there be under today's guidelines and rules? 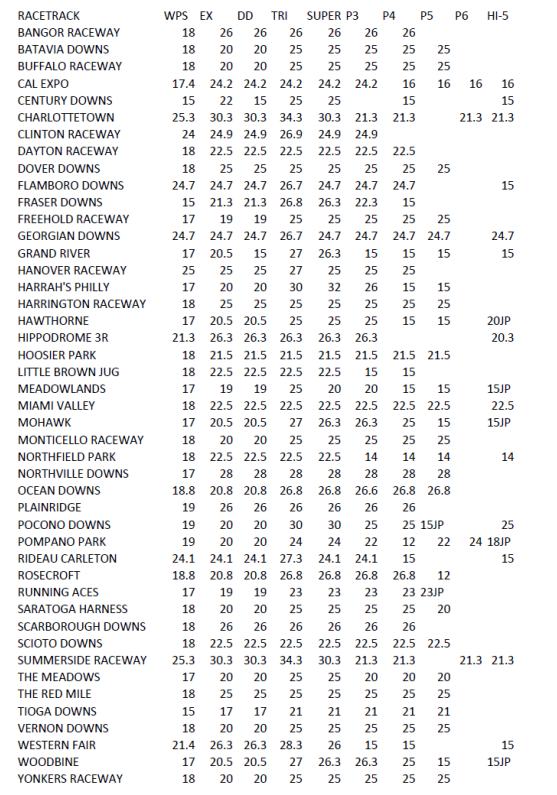 This chart was recently published in HANA's free e-magazine Horseplayer Monthly. Commissioners, horse racing should have a Commissioner too. Commissioners have one major goal and that is to grow the game's customer base while being mindful of the health of the athlete. They use uniform rules that are subject to change (if it is found that certain rules may cause too many customers to stray from their game, or if athletes are sustaining too many injuries). Commissioners have an ace in the hole, they can objectively impose significant fines and suspensions for cheating or bad behavior. Uniform fines and suspensions. If a L.A. Laker player gets caught doing drugs in L.A., he isn't only suspended in L.A. He can't play anywhere for however long the suspension is. If a Knick is caught doing exactly the same thing, he gets the exact same fine and/or suspension. This same standard will now apply in horse racing. Uniform medications. This is a no-brainer. As the new Horse Racing Integrity Act suggests, make a list of what can go into a horse's system and when, and make everything else illegal. This list should also include procedures such as "doing the stifles," and even go as far as regulating hyperbaric chamber use. 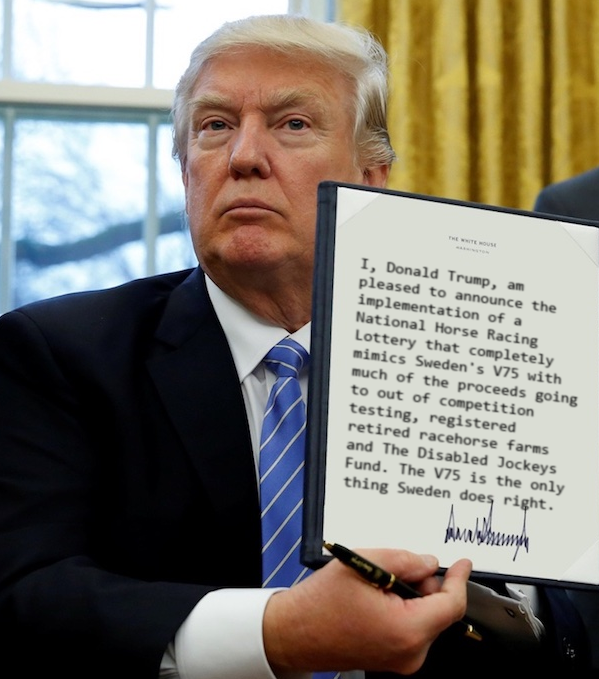 All procedures should be reported to the track and that info should be reported to the commissioner's office and posted on their website so horseplayers and horsemen alike can view it. The NFL has no problem making public when a player stubs his to even though it is illegal to bet on football nudge nudge wink wink. The Commissioner's Office will be in charge of monitoring out of competition testing as well. It should also be in charge of hiring the testers and placing them in the right areas. Uniform minimum wagering bet types. This will happen by osmosis if there is a Commissioner. 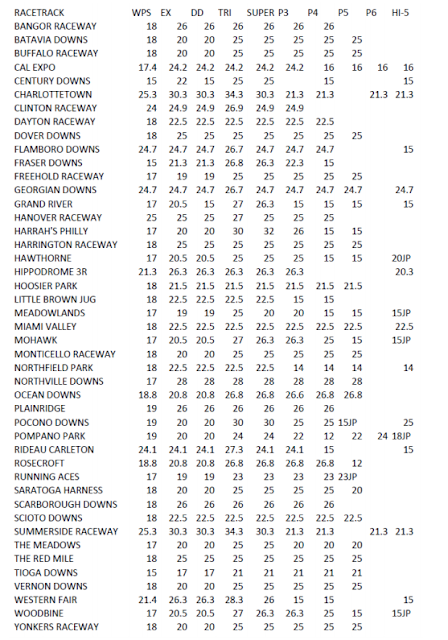 Payouts also will be uniform (tris will either show a payoff based on $1 or 50 cent bet at every track, for example). Uniform whipping rules. Whether it is decided that hitting a horse more than three times in succession is a no no, or if whips are eventually banned, every racetrack participant will operate under the same set of rules. Of course, track owners will be invited to Hawaii, where betting on horses will be legal by then, to participate in an annual Owner's Meeting where new proposed rules can be suggested and decided upon.... by the Commissioner's Rules Committee. That committee will be made up of mainly horseplayers. Speaking of Hawaii, a Commissioner's office might be able to focus resources to lobby to legalize horse race wagering in states that do not allow horse racing gambling at all and/or over the internet. The office can be a place to go to with new innovations. A Commissioner whose interest is to grow the customer base would most likely push through exchange wagering and even a national lottery. A centralized Inquiry Center. There will be two sets of eyes on each live race to look for fouls when not called by jockeys. If there is an inquiry, the same three judges get to make a decision whether the potential interference just happened at Delaware Park or Saratoga or both. It should be noted that the horseplayers will inevitably decide if they want the standard to be "if a horse wouldn't have beat the horse who interfered with it anyway, there is no DQ" or "there will be a DQ for any interference." This is where the ability to poll the customer comes into play. Also, in basketball, there is no need to hear from a player who may or may not have tipped a ball out of bounds. The same line of thinking should work with objective stewards not having to hear from jockeys. The replays should be enough to tell the whole story. If three stewards can't come to a full agreement, the results should stand, and there should be no need for an appeal. The stewards will also use objective standards when it comes to fair starts. The reason there won't be too many overlapping inquiries is because the Commissioner's Office will have final say on scheduling races. Tracks will submit the amount of race dates, their preferred post times and actual dates, and the commissioner's office will do its best to accommodate those race dates and also space all races as much as is humanely possible so races at multiple tracks don't go off at the same time nearly as much as they do right now. They might even be able to help negotiate optimal times with racetracks which will help racetracks be as profitable as possible. And yes, there will heavy fines for post drag violations. Bettors hate it, and that is what matters to the Commish. There are other things the Commissioner can look after, like capping takeout and push to eliminate breakage, but just about everything above can't be achieved without some form of a centralized body. I wrote the above article in the July edition of Horseplayers of North America's free e-magazine Horseplayer Monthly July 2017 Edition.